Today was one of the better days I've had on the river in the last few months. Fish were feeding heavily and once I found the right fly combination I was into fish pretty much the whole time. I fished a fly that I haven't really thrown yet this fall but was reminded how it has been one of the better tailwater patterns I've fished over the years. 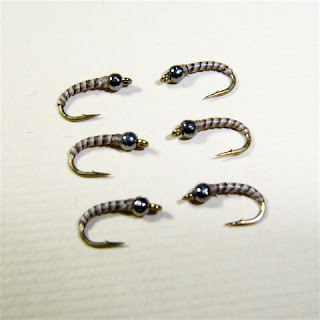 The hot fly was a midge larva pattern that I have fished out west on rivers like the Gunnison and Roaring Fork in Colorado as well as the tailwaters here in the east. If anyone doesn't tie and needs this pattern, I'm offering a few patterns now so just shoot me an email, and I can give you the details and pricing. The Caney has not had the best schedule for wade fishing, but you can still fish the upper river late in the day for a few hours once the water starts falling out. Right now the fishing is tough if you don't know the river well. These are the conditions when a good guide can be particularly helpful to put you on the fish. The water is still running quite cloudy which isn't helping those who prefer to sight fish. Fish are concentrated anywhere the water is funneling food. Shoals provide the best concentrations of fish right now, but fish are spread throughout the river as well. Late day midge hatches are coming on strong and bringing a few trout to the surface. Anglers that enjoy stalking trout with tiny dries and emergers can do well right now as long as they stay patient. Within the first 10 casts I caught 3 fish, a brookie, then a brown, and finally completed the slam with a rainbow. Throughout the afternoon, I managed more rainbows than anything else but did catch 3 beautiful brook trout and 3 browns including one chunky fish that was close to 18 inches. Despite my lack of trip reports, I actually have got a little time in on the stream. Over the last month, I have been on the Caney Fork a couple of times including a float trip with David Perry this past weekend. The river is fishing fairly well although the water is quite off color right now during generation. I'm not sure if the lake is turning over or if it is just a result of the low lake levels. Whatever the cause, the water clarity could definitely be better. A few weeks ago, I went down for an afternoon on the river and had one of my best outings in a long time. The days where expectations are low seem to turn out the best, and this was one of those days. I fished here and there before finally settling onto a nice riffle that spills over into a deep run. It seemed that every rainbow in the river had moved up into the shallows to feed. The routine was so simple that it almost was ridiculous. Throw in my nymphs, watch the indicator dive, raise the rod, and voila, a trout was hooked. On this and subsequent trips, the hot fly was a Ray Charles which does a good job of imitating the scuds and sow bugs present in the river. 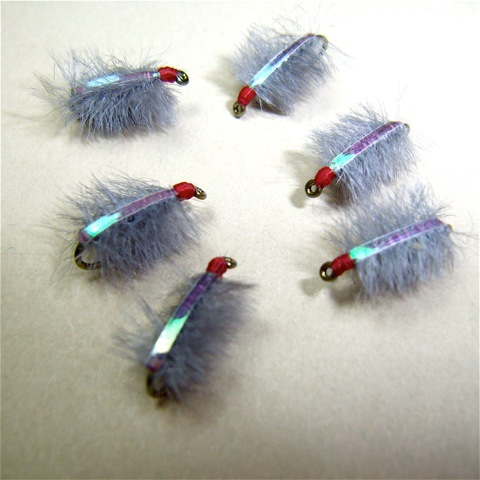 For anyone who is unfamiliar with this fly, I highly recommend giving it a shot. At certain times of the year it is particularly effective. If you don't tie and need a source for this fly, contact Trevor Smart at customtiedflies@gmail.com. He charges $1.50 per fly and ties other patterns as well such as the South Holston staple, a Tungsten Bead Stripper Midge (#20-#22). This past weekend's float was very similar. 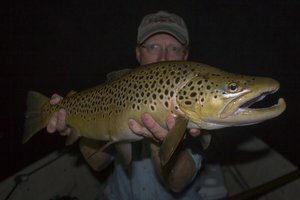 Early on, I started out throwing streamers in the hopes of finding an aggressive monster brown. All that wanted to play though were the rainbows. Later, the nymph rod did the trick with the Ray Charles producing well most of the day and Copper Johns picking up the slack later on. The fish all seemed to be quite healthy including one hot rainbow that came from a slot up against a log. This fish shot out of the water in the first of several jumps as soon as it was hooked, truly one of the better aerial shows I've seen from a trout this whole year. I FINALLY saw a train on the tracks along the Caney on this particular trip. Up until this float, I had NEVER seen a train anywhere around the Caney although I could only assume that the tracks weren't just there for nothing. Best of all, we caught the train as it crossed the Smith Fork bridge, providing a photo opportunity that few get without either getting lucky or going to some effort. Late in the day, we found three Bald Eagles that also gave me an opportunity to use my camera. Someday I'll have a better zoom lens, but in the meantime I'm just glad to have seen these beautiful birds and documented the experience. We also saw deer and even the river itself provided incredible opportunities for my camera. Fog makes the river almost eerie yet beautiful at the same time. I am now working on offering hi-res versions of photographs for sale through a new blog. The Trout Zone Photoblog will be highlighting what I consider my best photographs and offering them through a website called Fotomoto. This site allows me to place a toolbar directly into my blog for people to order prints and digital downloads. I will be including the toolbar here at the Trout Zone as well, just not emphasizing the photographs. In the meantime, please check out the new Photoblog, and let me know what you think! There is something mesmerizing about water in free fall. Within an hour of home, I can be hiking to any number of waterfalls, some well known, others obscure and difficult to find. In fact, there are several smaller ones (up to 30 feet high or so) within walking distance of my house. When I want to get out in nature and just hike, I'll often make a waterfall my destination. About a month ago, we took some of the kids from where I'm teaching down to Burgess Falls State Park to take in the scenery and do a little hiking. Everyone was enthusiastic to see what was new to most of them. For me, I just wanted to do some photography since I had not photographed this particular falls before. The following is a small sample of the falls we saw on our hike. My yearly fall pilgrimage to the mountains was last weekend, and as always, it was very memorable. 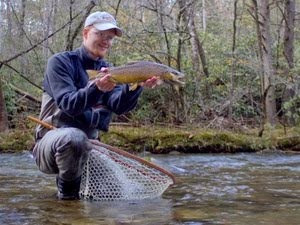 The fall BWOs were pouring off late each afternoon in tremendous numbers on Deep Creek, and the October Caddis were getting the fish to look up anytime they made an appearance. The elk in Cataloochee were mostly done with the rut, but a few bulls were still hanging out with their harems. Several friends made the trip and my cousin and his wife came up for the weekend. Camping is a lot more fun with a good group, although since I was the only fly fisherman my time on the stream suffered a bit. It wasn't entirely a bad trade off though. Sometimes the relaxation of camping is more needed than tons of time on the water. After the first 8 weeks of school, I was more than ready for a break. The opportunity to just sit around the campfire and stare into the coals was just as relaxing as spending lots of time chasing trout. As much as I love the fishing, its not always just about catching trout. Upon arriving at the Deep Creek Campground, we set up camp quickly and then headed up the trail to see Tom Branch Falls and Indian Creek Falls. Naturally, I rigged up a four weight with a pair of nymphs and took it along just in case. For the dedicated fly fisherman, just in case always happens. After we saw the two falls, I found myself flinging flies into a nice pool hoping for something, anything. It had been too long since I was on the water and just about anything would make me happy. First strike, a warpaint shiner...okay, maybe not anything...maybe just any trout. The next strike was a lot more solid, and I was soon admiring one of Deep Creek's beautiful rainbow trout. I always head over to Deep Creek to chase the browns, but there is an excellent population of rainbow trout that are always brilliantly marked. That night, we gathered branches and limbs from around the campground to make a big fire. Supper was hobo stew so the fire had to be the perfect temperature...too hot and your food is burned, too small and it never cooks all the way. We boiled water for hot chocolate as the evening was growing chilly. The warmth of the fire kept us all close until we finally bolted for our tents and warm sleeping bags. The next morning was cold so most of us slept in until the sun cleared the ridge. Once up, we made pancakes for breakfast and then started preparing for our day. Some of the group had to leave for the weekend while my cousin Nathan and his wife still had to arrive. After making a phone call, we decided to wait for them to arrive and then head over to Cataloochee for the afternoon. As soon as they rolled into camp and got set up, we headed out and cruised through Bryson City, then Cherokee, and finally Maggie Valley before turning north towards I-40. Just before the interstate, we found the small road that leads up and over the looming ridge and into the paradise that is Cataloochee. Previously an out of the way little visited corner of the park, Cataloochee has become a major tourist destination within the Park because of the reintroduction of elk. Most people wouldn't bother making the drive without such motivation. If you intend to drive to that area, just be aware that while it might only take you twenty minutes to drive the winding mountain roads between the valley and the interstate, the hordes of tourists can slow your trip down to a crawl. We got into one such painfully slow caravan, but by and by, the valley opened up below us in a beautiful panorama of fall colors. Not long after reaching the valley floor, we came upon two large bull elk that always seem to hang out in the same area. We stopped for pictures before moving on up the valley. Driving slowly, we stopped at several places to enjoy the views, the colors, and the camaraderie. As the sun moved lower in the sky, we started to remember that we were hungry. While driving through Maggie Valley we had noticed a small Italian restaurant called Garlic Knots. Everyone thought it sounded like the perfect end to a good day in the mountains so we headed back out for a great dinner. I had the daily special, a garlic and spinach ravioli that came with salad and bread sticks. Next time I'll probably try one of the house specialty brick oven pizzas. There were so many items that sounded good, but one can only eat so much at a time. After supper, we headed back towards Bryson City for an evening of hanging out around the campfire. In camp, the hot chocolate and smores came out again. Friday evening was even colder than Thursday evening was so we were really glad for a warm fire. The night sky was tremendous because the cold front a few days previously had ushered in much drier and cooler air. The low humidity made the sky seem so much clearer. 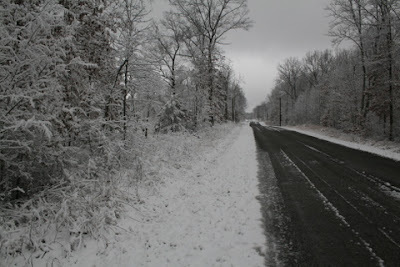 The next day, we headed over to the Road to Nowhere. Previously I had never made the time to go that way so it was interesting to drive to the end and walk through the tunnel. We also stopped to fish Noland Creek. 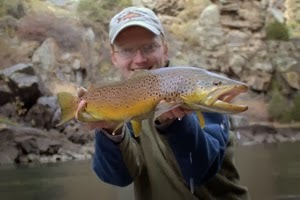 I always enjoy adding new streams to my list of "fished" streams so this was a great experience. Over the next few months, I hope to add more of the North Carolina streams to my list of places fished. I still need to fish Forney, Hazel and Eagle Creeks. Next spring some backpacking might be in order. One highlight of the trip was fishing down at the mouth of a stream as it entered the lake below. I spotted several fish rising so tried a dry/dropper rig. This was not working well in the low clear water so I decided to go to the opposite extreme with a Clouser. The first cast didn't produce but the next one brought a hard charging shape from the depths. I watched as the trout behind moved quickly to close the gap. In one fluid movement, it closed on the fly and inhaled it. Streamer fishing can be as visual as dry fly fishing and perhaps even more so, and this case was no exception. 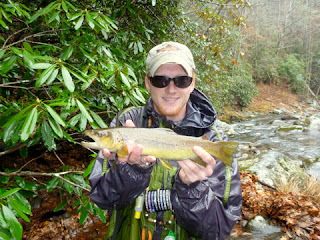 I battled a nice rainbow in for a quick picture before heading back up the stream to try for some of the resident fish. That evening, I fished Deep Creek again. The BWOs were out in force again. In every pool and slick, I found plenty of rising trout. 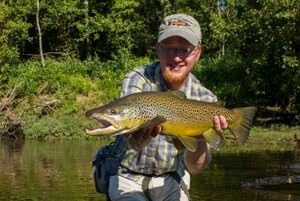 One particularly perfect cast finally yielded a mighty brown that came up from the depths of a glassy pool to sip my tiny parachute pattern. After an intense battle, I wrestled the nice fish into the shallows and subdued it long enough for a picture. 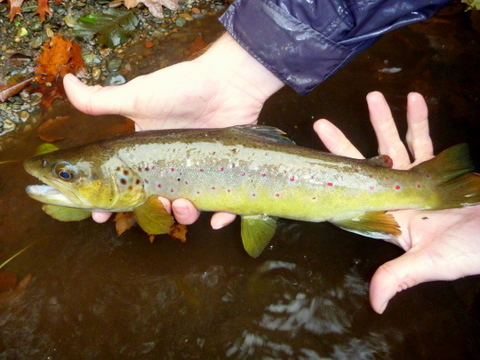 I returned it to the stream and hope that it will grow into an even more impressive fish in the years to come. The final day of a camping trip is always bittersweet. I never really want to leave the mountains so I enjoy my time to the fullest while it lasts. The last day was mostly dedicated to fishing. I tried a couple of favorite streams (still on the NC side) and had memorable moments on each. The first stream is one I don't really fish often enough but always enjoy when I do. I was specifically looking for big browns but doing a little "regular" fishing while I was at it. After a few hours on this stream, I started to think ahead and decided it would be best to head in the general direction of home. On the way, I was driving along when, like a bolt of lightning, I felt an irresistible urge to pull over and look for big fish in a spot that I normally wouldn't have stopped at. Creeping through the trees to a high bank overlooking the stream, I cautiously looked slowly up and downstream. Just as I was about to turn away and head on down the road, a dark form materialized in the middle of the run below. My heart started to pound as I stared in awe at the nice fish below. This was the fish I had been dreaming of and it was sitting out in the middle of the stream, shallow enough that I had a good chance of catching it. I ran back to the car and got my fly rod and slipped downstream. Not wanting to make any mistakes, I purposefully slowed down and made sure everything went smoothly. The double nymph rig landed about three behind and to the side of the trout on the first cast which was fine by me. I always try to get my distance figured out and would rather cast short instead of too long. A short cast won't usually spook the trout. On the second cast, the flies dropped into the water just upstream of the fish. The big fish turned and followed them downstream and when it turned, I gently set the hook. I didn't want to spook the trout but needed to set in case it had eaten. Three casts in a row produced the same result, but on the third cast, the big fish moved up slightly farther and settled closer to the bottom. Convinced that I had put the fish down, I headed back up to the car to get more flies and to watch the fish again from the bank above. Back on the bank, I was shocked to see the fish rise and sip something off the surface and new immediately what fly I was tying on next. Out came my special October Caddis pattern and back down to the water I went. The first cast was again made purposefully short to judge the distance, but the second cast was right on the mark. 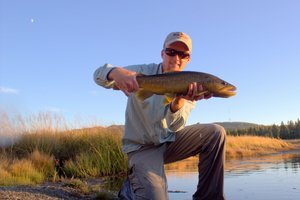 I watched as the fish seemed to ignore the fly, and then at the last second, the trout ghosted up and sipped the big orange caddis pattern slowly but deliberately. The line came tight as I raised the rod tip and the fish immediately went crazy. It ran up and down the beautiful run and almost made it to the faster water below before I finally corralled it for pictures. As much as I enjoy catching big fish, I was honestly disappointed that this fish turned out to be a rainbow. One of these days I'll get another big brown in the Park. Still, I won't complain too much since catching a big fish is always fun regardless. This fish had clearly run up from hatchery supported water below and had the typical big head and snakey body from living in the less than fertile mountain stream for an extended period of time. My heart still beating rapidly, I headed back to the car to drive to another stream and hopefully more large trout. One particular hole had been in the back of my mind for the whole weekend. As I approached, I was surprised that there were no cars parked there but was not going to complain. This particular pool can be super hard to fish with low flows because the water is so still. Accurate drifts with nymphs can be close to impossible without spooking every trout in the pool. Still it was worth a shot. The first few fish were run-up stocker rainbows but then a flash of color indicated a wild fish on the line. As I took a few pictures of the gorgeous rainbow, I was more than rewarded for stopping. Surprisingly, there was still another surprise in store. As I worked towards the back of the pool, my indicator dove under. With the first flash, I was almost convinced I had finally hooked a nice brown. Two bulldogging runs later, I realized from the colors that it was a brookie. In fact, it was the largest brookie I have hooked to date. Again, this was clearly a run-up fish from hatchery supported water below but I was still thrilled to hook and land such a beautiful fish. Later that afternoon, I ran into Ian Rutter looking for large fish and heard about some of the nice fish they had hooked that day (mostly on dries). Apparently the North Carolina side streams are all alive and well, producing good to excellent fishing for anglers that know how how to fish them.